With our years of industry experience, we are able to successfully cater to the variegated demands of our clients by offering them a precisely engineered array of Double Beam EOT Crane. Used for handling large amount of materials, this product is designed with high level of precision at par with international quality parameters. Moreover, the technology we use in the manufacturing process of this range is regularly upgraded as per the latest technological developments takes place in the industry. 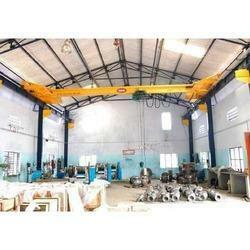 We are the leading manufactures and suppliers of Double Beam EOT Crane in Coimbatore, Mettupalayam, Salem, Tirupur, Pollachi, Trichy, Salem, Erode, Madurai, Tirunelveli , Chennai, Nagarkovil, Kanniyakumari, Tuticorin, Namakkal, Vellore,Theni, Dindugul, Ooty, Kunoor, Valparai, Kodaikanal, Kannur, Kozhikode, Malappuram, Palakkad, Wyanad, Kasargod, Kalpatia, Thrissur, Eranakulam, Iduki, Kootayam, Alapuzha, Kollam, Thiruvananthapuram, Patmanathitta, Kurnool, Anantapur, Cuddapah, Nellore, Chitoor, Prakasam, Guntur, Krishna, West Godaveri, East Godaveri, Vishakapattinam, Chikmangalur, ChitraDurga, Hassan, Tumkur, Mandya, Bangalore, Kodagu, Mysore, Kolar, Tamilnadu, Karnataka, Andrapradesh, Kerala and India..
We are leading manufacturers and suppliers of Eot Cranes to our clients. eot cranes are fabricated using premium quality raw material and designed using latest CAD facility to suit the clients requirements. Our engineers and researchers carefully study and do detailed analysis of clients requirements before deciding the suitable design. This enable us to reduce cost by designing optimum eot cranes designs, minimum crane structural weight, wheel loads headroom and clearances. We are the leading manufactures and suppliers of EOT Cranes in Coimbatore, Mettupalayam, Salem, Tirupur, Pollachi, Trichy, Salem, Erode, Madurai, Tirunelveli , Chennai, Nagarkovil, Kanniyakumari, Tuticorin, Namakkal, Vellore,Theni, Dindugul, Ooty, Kunoor, Valparai, Kodaikanal, Kannur, Kozhikode, Malappuram, Palakkad, Wyanad, Kasargod, Kalpatia, Thrissur, Eranakulam, Iduki, Kootayam, Alapuzha, Kollam, Thiruvananthapuram, Patmanathitta, Kurnool, Anantapur, Cuddapah, Nellore, Chitoor, Prakasam, Guntur, Krishna, West Godaveri, East Godaveri, Vishakapattinam, Chikmangalur, ChitraDurga, Hassan, Tumkur, Mandya, Bangalore, Kodagu, Mysore, Kolar, Tamilnadu, Karnataka, Andrapradesh, Kerala and India.. 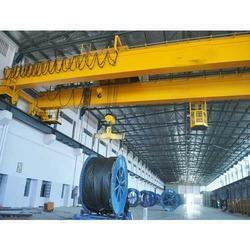 In workshops where part utilization of shop bay is Semi EOT Gantry Crane required (as in a tool room attached to a press shop), a Semi-Goliath/Gantry Crane is used. In such a configuration, one end-carriage of the crane will travel on the regular gantry rail while the opposite end-carriage will travel on a rail mounted typically on the ground or at a lower elevation. We are the leading manufactures and suppliers of Semi EOT Gantry Crane in Coimbatore, Mettupalayam, Salem, Tirupur, Pollachi, Trichy, Salem, Erode, Madurai, Tirunelveli , Chennai, Nagarkovil, Kanniyakumari, Tuticorin, Namakkal, Vellore,Theni, Dindugul, Ooty, Kunoor, Valparai, Kodaikanal, Kannur, Kozhikode, Malappuram, Palakkad, Wyanad, Kasargod, Kalpatia, Thrissur, Eranakulam, Iduki, Kootayam, Alapuzha, Kollam, Thiruvananthapuram, Patmanathitta, Kurnool, Anantapur, Cuddapah, Nellore, Chitoor, Prakasam, Guntur, Krishna, West Godaveri, East Godaveri, Vishakapattinam, Chikmangalur, ChitraDurga, Hassan, Tumkur, Mandya, Bangalore, Kodagu, Mysore, Kolar, Tamilnadu, Karnataka, Andrapradesh, Kerala and India..
We take pleasure to introduce ourselves as the renowned manufacturer, trader and supplier of high quality Single Beam EOT Cranes. This EOT crane is designed by contemporary technology and finest quality material in agreement with set industrial norms. In addition, the travelling offered by us is EOT crane is available in numerous specifications from us as per the market preferences. 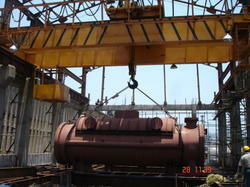 Our valuable patrons can avail this EOT crane from us at competitive price. We are the leading manufactures and suppliers of Single Beam EOT Cranes in Coimbatore, Mettupalayam, Salem, Tirupur, Pollachi, Trichy, Salem, Erode, Madurai, Tirunelveli , Chennai, Nagarkovil, Kanniyakumari, Tuticorin, Namakkal, Vellore,Theni, Dindugul, Ooty, Kunoor, Valparai, Kodaikanal, Kannur, Kozhikode, Malappuram, Palakkad, Wyanad, Kasargod, Kalpatia, Thrissur, Eranakulam, Iduki, Kootayam, Alapuzha, Kollam, Thiruvananthapuram, Patmanathitta, Kurnool, Anantapur, Cuddapah, Nellore, Chitoor, Prakasam, Guntur, Krishna, West Godaveri, East Godaveri, Vishakapattinam, Chikmangalur, ChitraDurga, Hassan, Tumkur, Mandya, Bangalore, Kodagu, Mysore, Kolar, Tamilnadu, Karnataka, Andrapradesh, Kerala and India..